See what’s happening at the Zoo today, April 24th, 2019! Thank you for your continued support of your Zoo! *Inclement weather, including excessive heat, cold, and/or rain and storms may cause the early closure some habitats, attractions, food/retail locations, etc. Please note: While our goal is to provide opportunities for our visitors to see all the animals in our care, there are times when an animal may be off view or given access to their indoor space in order for our team to provide the best care possible. Temperatures must be 45 degrees or warmer for Fiona the hippo to be outside. There is no indoor viewing area. The back path of the elephant habitat between Go Green Garden and Education is closed indefinitely. Bald Eagles will be in the Komodo Habitat until further notice. Cougars, White Lions, Tigers, and Snow Leopards will have access to their outdoor habitat. 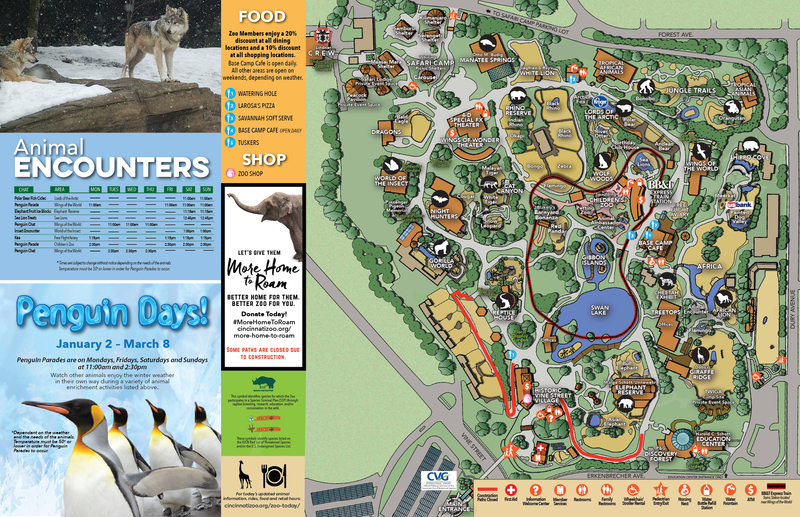 Food location hours & animal appearances vary by season. Ask us when you arrive for details on how to make the most of your visit! Click here to view larger version of map. 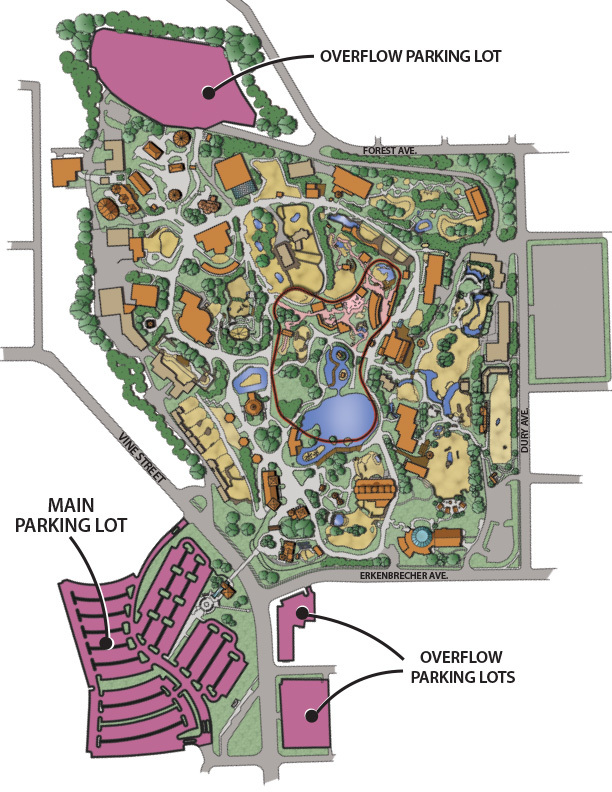 The Cincinnati Zoo is located at 3400 Vine St., Cincinnati, Ohio 45220. The main parking lot & entrance is on Vine Street. Click here for a parking map. 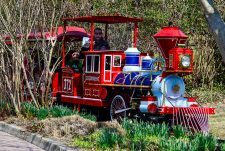 The Zoo season is packed with special events and Animal Encounters that will delight the entire family. Click here to see upcoming events! The Zoo is open January 1st – December 31st at 10am. The Zoo is closed on December 25th only. *PNC Festival of Lights is closed Thanksgiving Day, Christmas Eve. The Zoo is closed all day on Christmas. Shop online for retail items here! 4-D Theater Gift Shop: Open 9:30am – 3pm. Will I see baby hippo Fiona on my visit? Does the Zoo have strollers and wheelchairs? The Zoo has both strollers and wheelchairs for rent at the Welcome Center, located in Historic Vine Street Village, or at the Conservation Carousel in Safari Camp. We have a limited inventory and provide these items on a first come, first served basis. No advance registrations available for strollers or manual wheelchairs, however there are a limited number of ECVs (Electric Convenience Vehicle) that can be reserved each day – reserve an ECV (reservations are not accepted the day of visit). We recommend arriving early to secure strollers and manual wheelchairs. For all rentals, a photo ID must be left with Zoo Staff at the rental location. Please note: if you are a member or have purchased a ticket that grants early entry- the Welcome Center is open when the Zoo opens. Rental Fee information is available here. 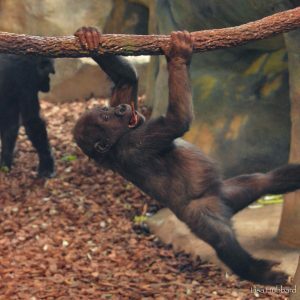 When are the best times to visit the Zoo? The Zoo is generally busiest on weekends and holidays (holiday weekends, Spring Break, etc. ), but may have higher attendance than normal on beautiful weather days. To avoid most traffic and parking delays- we suggest arriving before 10:30am or after 2:30pm. Should you plan to arrive during those times on a weekend or beautiful weather day, there may be lines and delays for entry. Please know that our staff is doing everything possible to facilitate entry for all of our visitors! What animals will be out when I visit? Animals on view during your visit will not only depend on weather, but the time of day you are visiting. 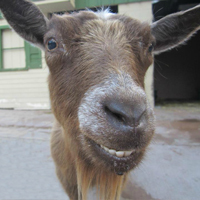 Check our Zoo Today page on the day of your visit for updates on animals not on view for the day. Commercial use of photographs, video and film taken at the Cincinnati Zoo is strictly prohibited without the Zoo’s full written consent. 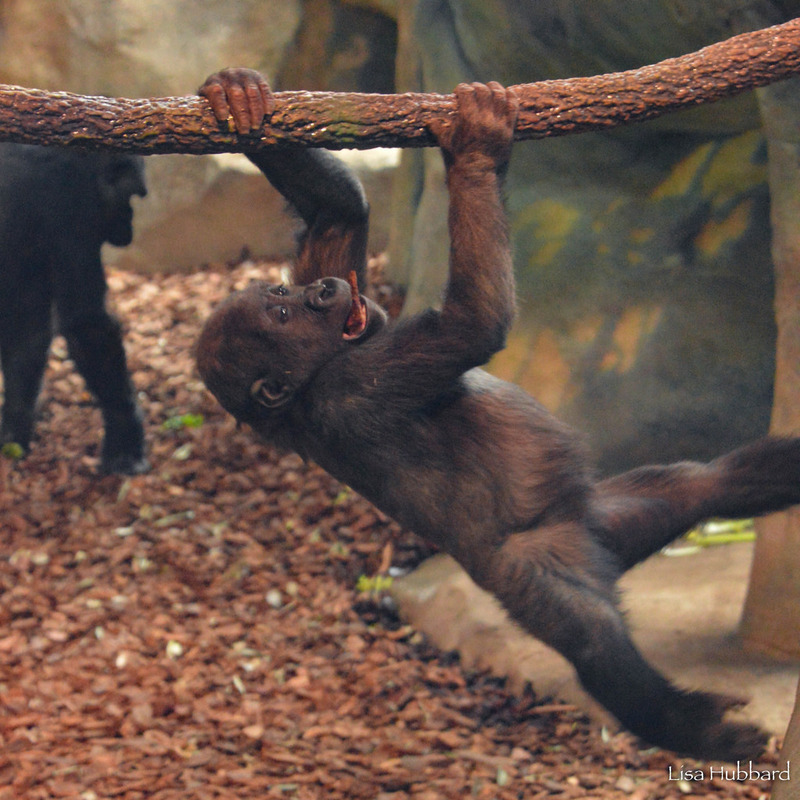 Feel free to share photos with family and friends using #CincyZooPic! Location Filming Guidelines: Film crews must contact [email protected] in advance to set up their video shoot and pay a fee to shoot on location. NO SMOKING or VAPING! The Cincinnati Zoo & Botanical Garden is a SMOKE-FREE ENVIRONMENT Call 1-866-559-OHIO for questions or to report violations. For health and safety reasons, please do not feed the animals or disturb any plants. Bicycles, skates, Heelys, hoverboards, skateboards, roller blades, scooters and portable radios are not permitted on Zoo grounds. Please stay on paths. Pets are not permitted on Zoo grounds even if left inside vehicles. Shirts and shoes must be worn at all times. Because the park remains open during inclement weather, the Zoo offers no refunds or rainchecks. Because of the varying needs of the animals, some buildings or exhibits may close early. All visitors grant the Cincinnati Zoo & Botanical Garden permission to use their image, or that of their children, in advertising, publicity and other promotions without payment or compensation to the visitor. Where can I get a Zoo Gift Card? Zoo Bucks (Gift Certificates) are available for purchase here and can be spent anywhere at the Zoo, including admission! Gift Memberships are also available by clicking here. What Hotels are Near the Zoo? Visit our “where to stay” page for more information on hotels and lodging. Visitors are welcome to bring food and beverages to the Zoo with them. Alcohol is prohibited. Where can I find nutritional information about food sold at the Zoo? Please click here for nutritional information, including information about allergy needs and Zoo food! Smoking, including e-cigarettes, is not permitted on Zoo grounds. If your current membership is held with a Zoo that participates in the reciprocal program with the Cincinnati Zoo, you are entitled to a discount on admission. You can check our list of participating reciprocal institutions here. Please note: this discount may only be applied at the Cincinnati Zoo ticketing windows. How do I find information on encounters? Does the Zoo have a Lost and Found? Yes. For all Lost and Found inquiries, please visit Membership Services/Guest Relations or call us at 513-559-7713. Are service animals allowed in the Zoo? The Cincinnati Zoo & Botanical Garden is committed to welcoming all visitors, and complies with the ADA Title III regulations regarding service animals. Therapy or emotional support animals are not permitted in the Zoo. If your animal does not meet the ADA requirements for entry, we will gladly provide information on local kennels where your dog can stay during your Zoo visit. Upon entry, service animal users will be greeted by a Visitor Experience Supervisor to be checked in with the two legal ADA questions regarding service animals. Members are encouraged to get a notation on their membership card to expedite entry during future visits. Drinking water is available for service animals at all open concessionary stands free of charge. Service animal relief areas can be found in the grass in the Vine Street Parking Lot or at the Safari Camp Picnic Shelters as indicated on the Service Animal Map. Service animals are welcome in all restaurants, restrooms, and on all rides and attractions. While your service animal has been socialized for most public settings, touring a zoo – especially for the first time – can be an unusual experience. Some areas of the Zoo have been observed to be dangerous or stressful to either Zoo animals or service animals. The Zoo has worked with local service dog training organization, Circle Tail, Inc., to identify sensitive and restricted areas of the Zoo with training and in training service dogs. Goat Yard, Galapagos Tortoise Yard, Free-Flight Aviary, Butterfly Aviary, and Behind-the-Scenes Tours: direct contact between service animals and Zoo animals poses risk for zoonotic disease transmission. Wings of Wonder Bird Experience (Memorial Day-Labor Day): free-flight birds have become distracted from their behaviors in the presence of service animals, which can lead to safety concerns for Zoo animals and keepers. Wolf Woods: wolves have displayed stress behaviors in the presence of service animals. Jungle Trails: primates have displayed stress behaviors in the presence of service animals. Gorilla World: primates have displayed stress behaviors in the presence of service animals. 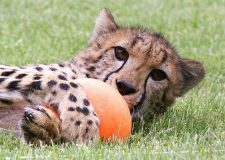 Cheetah Encounter: cheetahs, domestic cats and domestic dogs have become distracted from their behaviors in the presence of service animals, which can lead to safety concerns for Zoo animals and keepers. The Zoo reserves the right to designate areas as restricted or sensitive without prior notice if a service animal’s presence is demonstrated (through prior or current situations) to cause a Zoo animal undue stress or anxiety, or as a result of new births, breeding behavior, or new animals in habitats. Service animals must be harnessed, leashed, or tethered or controlled by voice commands. Service animals are expected to stay off rock barriers, keep all paws on the ground at Zoo habitats, and not bark at Zoo animals. Service animals should be kept at least 10-feet away from Zoo animals presented with interpreters or walking outside of habitat space. Direct contact between Zoo animals and service animals is prohibited. Care and supervision of service animals is solely the responsibility of the owner. Per the ADA, service animals may be excluded if their presence alters the nature of the Zoo’s services or if the animal is out of the owner’s control. If a service animal is excluded, the owner will be able to visit without the service animal. For more information or assistance, please call or stop in to see a Visitor Experience Supervisor. We offer a military discount for all military personnel and their families. This discount is for $3 off adults and $2 off children. Military ID is required to receive discount and may only be obtained at the Cincinnati Zoo ticketing windows. A full list of our discounts can be viewed here. I have a conceal/carry permit. I am allowed to bring my firearm on Zoo grounds? The Zoo does not allow any firearm to be brought on grounds, regardless if the individual has a conceal/carry permit. I have a question about wildlife outside of the Zoo. Who can I contact? In an effort to make sure our keepers have enough time with their animals, we unfortunately cannot accept calls regarding questions about animals outside of the Zoo. The Ohio Department of Natural Resources (1-800-WILDLIFE) is a great resource!